The most popular musical of all time, Andrew Lloyd Webber’s magical creation, “The Phantom of the Opera” came to Huntington Beach. Academy of Performing Arts’ (or APA) Musical Theatre Department who performed the show throughout the month of March. There were six shows performed in total, on March 15-17, and March 22- 24. It was performed in Huntington Beach High School’s District Auditorium and Bell Tower. Not only did “The Phantom of the Opera,” practically fill every seat, every night, but one of the people filling those seats was truly extraordinary. 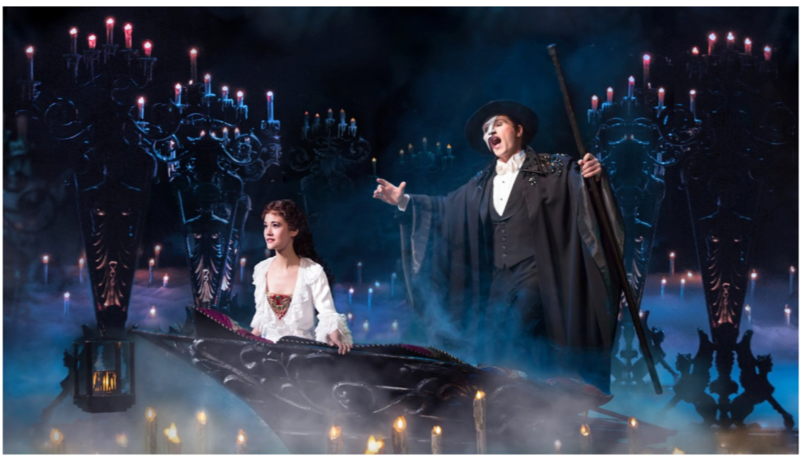 Believe it or not, the famous Michael Crawford, the original “Phantom” himself, went to see the incredible show. Before the show opening night, the kids were sent a heart-warming, handwritten note written by Michael Crawford. This excited and amazed the students before going on, and was even posted to the HBAPA Instagram. However, the real surprise for the audience came when it was revealed on closing night, March 24, that Michael Crawford had been in the audience. He then came onstage and gave a speech to the performers, and the audience. He asked probing questions and talked about performing and the show “Phantom.” Clearly, this show was one for the ages. The lyrics for the show were created by Charles Hart, with help from Richard Stilgoe. The book was made by Richard Stigloe and Andrew Lloyd Webber. The story is based on the popular novel, Le Fantome de ‘l’Opera, by Gaston Leroux. “The Phantom of the Opera,” is the world’s longest-running Broadway show of all time, with almost thirteen thousand shows performed. For years the score has been one of the most popular on the planet, with some of the most amazing songs ever written. These include, “Think of Me,” “Wishing You Were Somehow Here Again,” “Angel of Music,” “All I Ask of You,” “Music of the Night,” “Masquerade,” and the fabulous title song, “The Phantom of the Opera.” These songs are not only beautiful but also incredibly challenging. It is very impressive for a high school to be able to pull off this show. The story itself is a thrilling one, that is definitely worth seeing. Academy of Performing Arts describes it on their website as, “a timeless story of seduction and despair.” The Phantom of the Opera follows a terrifying masked man, who underneath the Paris Opera House in the catacombs, horrifying all who set on its grounds. He falls madly in love with the extraordinary soprano Christine and devotes himself to training her and nurturing her talents to create a new star. The students in the Academy of Performing Arts worked incredibly hard to put together the best show possible, and it sold out. Overall, the show, “The Phantom of the Opera,” is not one you ever want to miss. The hard work from the students and teachers paid off.